Yours truly and Luis de Sousa have been using the Charge of the Light Brigade as a metaphor for the UK's brainless charge for Brexit. But perhaps it is Boris Johnson himself who came up with the more appropriate metaphor when he said that the UK was going to make "a Titanic Success of Brexit". The metaphor is all the more apt as the Titanic had been built in the famous Harland and Wolff shipyard - a fact that is now commemorated in the Titanic centre in Belfast. The DUP has also been leading the charge towards a Brexit which could well jeopardize the very union between N. Ireland and Great Britain they so claim to cherish. It is now almost two months since Theresa May agreed her deal with the EU Council and very little has changed or moved on in the meantime as the great ship of state sails inexorably on towards a hard Brexit on 29th. March. If the 117 Tory MPs who voted no-confidence in Theresa May's leadership combine with the DUP, May's deal could well go down by over 200 votes in the House of Commons vote on January 15th. No prime minister in history would have been subjected to such an emphatic defeat on such a major issue and survived, and yet Theresa May might fight on. Brexiteer Tory MPs effectively handed May a 12 month stay of execution when they precipitated an ill-judged no confidence motion in December and the DUP have said they will continue to vote Confidence in the Government (while threatening to vote down almost all else) for fear of precipitating a general election which Jeremy Corbyn might well win. So we have a lame duck prime minister at the helm set on a course headed for a hard Brexit and no mechanism to change course, or have we? Finbarr Flood was one of my first bosses in Guinness and taught me much of what I have learned about surviving in big business. He had joined the company as a messenger boy aged 14 and also played semi-professional soccer as a goal-keeper in both Ireland and Scotland. Having risen through the ranks to become Managing Director, he left to pursue a further career as Chairman of the Irish Labour Court, Chairman of Shelbourne Football Club, and Chair of a number of city rejuvenation projects. Having left school at 14 he was extremely chuffed to receive an honorary Doctorate from the Dublin Institute of Technology and to become an adjunct Professor to Trinity College Dublin. a retrospective story for the season that's in it...Originally published Jul 26th, 2016. 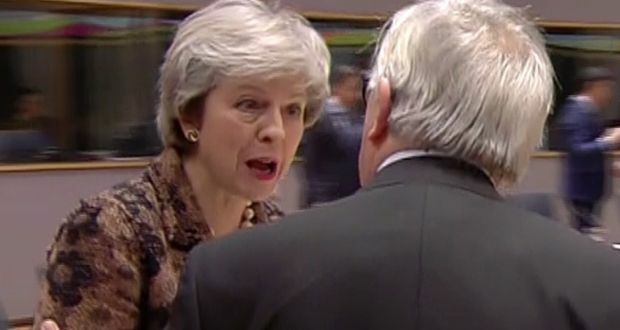 I haven't the foggiest notion what the difference between foggy and nebulous is in the context of the confrontation between Theresa May and Jean-Claude Juncker which occurred on camera at the European Council summit. She accused him of calling her nebulous and he responded that he had been referring to the debate in the House of Commons, not her, and that the word he had used was "nebuleux" in French which had been miss-translated as nebulous whereas he had meant foggy. Both mean vague, ill-defined or unclear, and that is precisely the accusation leveled at Theresa May by several heads of government after her one hour presentation which is said to have alienated and annoyed many on the Council. She told them to trust her judgement, when that is precisely what they no longer trust. You don't wrap up a legally binding deal after a long and complex negotiation only to come back looking for more changes a couple of weeks later and hope to keep your credibility intact. EU Heads of government were quite clear that any concessions they make now - without cast iron guarantees they will enable the passage of all required legislation through parliament - will simply be "banked" by UK Brexiteers before they come back looking for more. The European Court of Justice has found, in a clear and lucid judgement, that a sovereign state which has issued a notification (under Article 50) of its intention to withdraw from the European Union, retains the sovereign right to withdraw that notification "in accordance with its own constitutional requirements" until such time as it takes full effect. Unlike the Advocate General's earlier advisory opinion, it does so solely in accordance with European Law as established by the treaties, without relying on "custom and practice" in international law, or the Vienna Convention on the Law of Treaties (VCLT), which has not been ratified by the EU or France and Romania, although it notes that the VCLT "corroborates" this view. The Advocate General of the European Court of Justice has advised the Court that it should find that the UK can unilaterally withdraw its A.50 notification to leave the EU, subject to certain conditions. His finding is not binding on the Court, but it would be unusual for the Court to reject his finding in its final ruling, which could come in the next few weeks. In doing so, the Advocate General has rejected the view of the EU Council and the EU Commission that any revocation of an A.50 notification should be subject to the unanimous agreement of the EU Council. He has also rejected the view of the UK government that the issue is entirely academic and hypothetical, and therefor should be considered inadmissible by the court. Finally, and most dammingly, he has rejected my arguments to the effect that A.50 provides for no such right, and he goes on to quote the Vienna Convention on the Law of Treaties as providing for such a right, even while noting that the EU, France and Romania are not signatories to that Treaty. Instead he argues (para. 79) that the rules of customary international law are binding upon the Member States and the European Union and may be a source of rights and obligations in EU law. There has been much speculation as to what will happen when Theresa May loses the Commons Brexit vote, as she almost certainly will, on Dec. 11th. Most observers don't expect that vote to be even close, with some estimating a margin in excess of 100 votes. Some speculate such a defeat will finally trigger a challenge to May's leadership. But if Rees-Mogg's co-conspirators couldn't even muster 48 votes the last time around, it seems hardly likely they will be able to achieve the 158 votes required to win a vote of confidence against her leadership and trigger a leadership election. The downside for them is that the rules dictate that they won't be able to issue a renewed leadership challenge for another 12 Months if they fail. So they had better get it right the first time around. A lot will depend on how badly she still wants the job. So far she has won some grudging admiration even from her opponents for how she has stuck to her task against seemingly insurmountable odds. The other downside is that the rules suggest a 12 week timeline for a full leadership challenge and the election of a replacement, which almost takes us outside of the Brexit timeline altogether. It's hard to see the EU Council extending the A. 50 deadline just to allow a Prime Minister Johnson settle into his job. They have fulfilled their A.50 obligation to negotiate an exit deal. He can take it or leave it. The internal machinations of the Tory party are none of their concern. Can the UK reverse the Brexit process? `Where, in accordance with Article 50 of the TEU, a Member State has notified the European Council of its intention to withdraw from the European Union, does EU law permit that notice to be revoked unilaterally by the notifying Member State; and, if so, subject to what conditions and with what effect relative to the Member State remaining within the EU'. The Irony of the ECJ deciding on the UK's rights in this matter has not been lost on some observers, with some Brexiteers outraged the court is even considering the matter. A.50 provides that a member who has left the EU and wishes to rejoin must do so via the standard A.49 accession procedure. But A.50 is silent on what happens if a member issues an A. 50 notification and then changes their mind on the matter within the 2 year negotiation period before they actually leave, so some more clarity is welcome. The Brexit deal has been agreed by the European Council in the time it would take to eat a good breakfast brunch in a Brussels brasserie. No point in wasting a whole day on this sort of thing. It's happening for the optics only, to send one clear message to all concerned: THIS IS BREXIT, this is the deal, we are not going to revisit it. Take it or leave it. The House of Commons can huff and puss all it wants, vote for it, against it, amend it to its hearts content: But this is the deal. Mutti Merkel has said so. She wouldn't have wasted her time coming to Brussels if anyone was going to reopen the debate. Boris Johnson is absolutely right: This Brexit deal is a historic mistake, and he should know. He has been the prime mistake maker: leading the UK up the garden path of delusional dreams. Nothing encapsulates that delusion more than the gap between what this deal delivers for the UK and what the Brexiteers said they would be able to negotiate in "the easiest deal in history". Theresa May has survived numerous threats to her leadership to fight another day after a reasonably well received Tory party conference speech and UK Budget. The mood music on both sides of the Brexit negotiations appears to be that a deal can still be done in late November or early December at the latest. The adults have entered the negotiating room and remaining differences are being chipped away. A formula of words will be found to paper over the cracks and arrive at some sort of an agreement. The markets will breath a sigh of relief and Sterling will rise. Much of he media will hype the achievement of a deal almost regardless of the content. Dire warnings of the consequences of "no deal" have had their effect of dampening expectations and only the churlish will point out how far short the deal falls from the Brexiteer claims of "the easiest deal in history" achieved because "they need us more than we need them". My skepticism over the prospects of a substantial deal has always centered on May's ability to get any such deal through parliament. Have expectations been reduced enough to make the deal palatable? Are Brexiteers sufficiently desperate to agree any deal so long as it gets the UK out of the EU? Will Remainers vote for a deal so obviously worse than full membership because it avoids the nightmare "no deal" scenario? Can the DUP ever be appeased? Letter to the Editor, Irish Times. For all his criticism of the DUP, Newton remains of the view that Brexit is somehow just politics as usual, and the usual rules of politics should apply. But to quote WB Yeats, all has been changed, changed utterly, by Brexit. Time was when Taoisigh had to tip toe around unionist sensitivities for fear of exacerbating a very dangerous situation. Bertie Ahern's finest achievement was his contribution to the peace process. He deserves a reprieve from political purgatory for that alone. 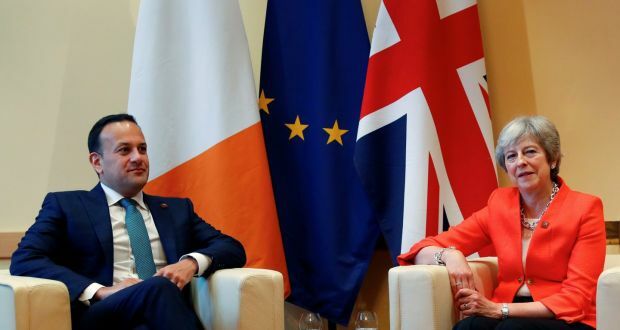 But the DUP's adoption of a pro Brexit policy in N. Ireland, against the wishes of 56% of it's electorate, is a full frontal attack on democracy, the peace process, the Good Friday Agreement, and all that is decent in Irish politics. To imagine it can now be business as usual in the aftermath is delusional. Frankly, the DUP have now been written out of the script as far as the future of Ireland is concerned. Loyalists can continue to vote for them if they wish, but no one will take them seriously. What Sammy Wilson "thinks" is good for satirical and comedy columns only. Mr. Varadker's job is to protect the interests of the people of Ireland from the very serious economic and political implications of Brexit. If that upsets some unionist or brexiteer sensitivities, then so be it. A "tin ear" can be useful in drowning out irrelevant noise. Certainly no one will take the DUP seriously outside its heartlands of north Antrim and east Belfast. There will be no functioning N. Ireland Assembly or Executive while the current crop of DUP "leaders" are in power, and until Brexit is done and dusted, one way or the other. Not only will the DUP be sold down the river by Theresa May, they will be the laughing stock of everyone else. Leo Varadker can bank a few thousand extra votes every time the DUP excoriates him. Michael Martin [Leader of the opposition and Fianna Fail] must be green with envy. I don't like saying "I told you so" and I have a policy of not simply replicating stuff I have read elsewhere, so where do you begin when the Brexit negotiating process is panning out precisely as you expected? It's like watching a supposed thriller where every new twist has been so well flagged in advance it all gets boringly predictable. I have avoided Hollywood movies for years because the script always seems to follow the same formula to the point where you cannot identify with any of the characters and you just don't care what happens to them. The scriptwriters are just playing with your emotions and seeking to manipulate your fears. And so we have Theresa May continuing to play out her role as the designated fall-girl, seeking to bring home a deal you just know will be rejected by the House of Commons. You have the EU Commission and Council playing out their role as the big, inflexible, bad, pack of wolves seeking to bully and disrespect the game and pugnacious Mrs. May. You have May continuing the fight even as some of her supposed warriors fall by the wayside - only to betray her by sniping at her from the ditches. And you have the cantankerous Irish only itching for a fight and being as awkward as possible. Why can't everybody just be reasonable and get along? My sociology lecturers used to joke that "common sense" was rarely common and almost never sensible. What is obvious to some can be very difficult for others. What works in one context can be sheer madness in another.